The Florida Department of Citrus will be forming a committee to come up with a new symbol that will help consumers know if they’re getting the “real” Florida product or not. 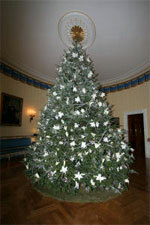 Here’s the Chistmas tree in the White House this year (courtesy of National Christmas Tree Association). Being in a Christmas mood I thought it made a good post matched up with a USDA story by Gary Crawford. Gary provides the latest on how Christmas tree exports are doing this year. I thought I was done for the day but I thought you might get a kick out of this. Thanks to Micro Persuasion for the link. You’ll be hearing a lot about this today and over the next couple days so I thought I’d give you a heads up. The Japanese border is open to U. S. beef. That’s big news for our cattle producers. USDA’s National Agricultural Statistics Service unveiled a newly designed website today. I went there wondering what’s new. Speaking of New York. There’s an interesting story in the New York Times (requires free registration) about rural wireless internet access titled “Money Is There to Aid Rural Internet, but Loans Are Hard to Get.” I’ve reported before on the USDA Rural Development program that provides loans to companies that want to install and bring more broadband access to rural Americans (farmers). PRWeek reports that the California Department of Food & Agriculture that could be worth up to $500,000 in the next year for “outreach and education on Pierce’s disease, which can devastate grapevines, and the glassy-winged sharpshooter, the insect that carries it.” You need a paid subscription for the full story, which I don’t yet have. The FAO just re-elected Jacques Diouf. If you need help pronouncing that give me a call. This is an interesting story since it was put out by the USDA’s Agricultural Research Service. I can’t find this iSOY Technology Corporation online anywhere though. It’s nice that they’ve made this announcement but it leaves you with very little information and in my quick search I couldn’t find much either.